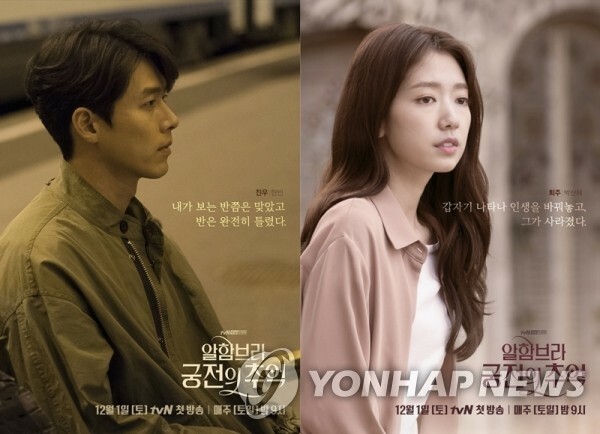 SEOUL, Nov. 28 (Yonhap) -- Yet another hotly anticipated television series, "Memories of the Alhambra," on the hit-making cable network tvN was unveiled Wednesday. Starring Hyun Bin and Park Shin-hye, the weekend series combines diverse genres together, ranging from fantasy and drama to suspense, science fiction and romance, raising high hopes among TV viewers for a well-made, attention-grabbing show. The upcoming drama, the network said, "tells love and endless desires of human beings through fantastical experiences where the two seemingly conflicting and different worlds of magic and science, analogue and digital, modern and medieval times and Granada and Seoul are mixed and mingled together." The first few episodes were shot in Granada, Spain, in accordance with the recent trend in the South Korean entertainment industry in which dramas are partly shot in overseas locations to differentiate themselves from countless competitors. The show has taken a step further to use augmented reality (AR) games as a core material to add fantastical aspects to draw viewers' attention. At the press conference held in Seoul on Wednesday, director Ahn Gil-ho said the AR technology featured in the show is actually more advanced than the current technology is. "It will show what will arrive in the near future," he said. Hyun Bin, a star from the 2010 hit TV series "Secret Garden," plays the male protagonist Yoo Jin-woo, CEO of an investment company who goes on a business trip to Granada to meet a game programmer, played by Chanyeol from popular K-pop boy band EXO. There, he gets involved in an unexpected incident with Jung Hee-ju (played by Park), an older sister of the programmer and the owner of the hostel where he stays. "When I take on a new show, I am looking for something different from my previous work, be it a story or a character. That the drama deals with AR certainly played a role in my decision to join it," the actor said. "As far as I know, it is the first South Korean drama to feature the technology, and I am wondering if the viewers can find it as interesting and refreshing as I did." "Beyond the entertaining elements of AR games, I was attracted to the story as I believed it sends out some social messages through the technology," Park said. "Moreover, I liked my character. She is very warm-hearted and humane. I can show diverse aspects as a guitarist and a hostel owner." Jung's programmer brother Se-joo holds a very important key to solve the mystery in the show, Park also added, refraining from elaborating on the character for fear of releasing a spoiler. Produced by Studio Dragon, one of the country's largest TV production companies, which produced such hits as "Guardian: The Lonely and Great God," it will also be released globally on the global streaming giant Netflix an hour after the premiere in South Korea. "Games are universal entertainment, cultural content. They make the show more interesting," the director said. "The drama has its own distinctive colors and a solid and immersive storyline. I am sure it is competitive enough to arrest attention in the global (entertainment) market." It is set to premiere at 9:00 p.m. Saturday.